Capacity from 5 to 50 Tn, stroke up to 150 mm. T and TE models are spring return. TD models are Double acting. For pulling applications: to hook and join plates for welding, tensioning cables, etc. Optional rubber rod cover for piston protection extends cylinder life. Optional telescopic metallic rod cover especially suitable for welding applications. 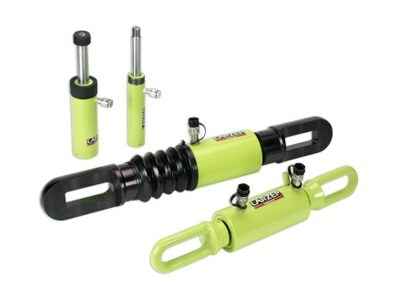 T series pull cylinders are available as options for the CA series maintenance sets. Plunger and base threads match the CA series accessories. * Models equipped with metallic protection have a 30 mm shorter stroke.